I always hoped to go viral on social media. Just not like this. On Monday evening, I was sitting next to my partner, Ryan, on a plane somewhere between Houston and Boston. All of a sudden, an enormous ponytail flopped out from atop the seat in front of him, over the in-flight entertainment screen, and down almost to his open tray table. It broke an unspoken rule of economy class: Keep your coats, extremities, and expansive hairstyles under strict control. Ryan and I spent a few moments exchanging can-you-believe-this looks. I snapped a photo, because the sight itself was comical. We waited. Once it was clear the ponytail owner, who was playing a game on her phone, was indifferent or oblivious, Ryan stood up and got her attention. Barely looking up from her device, she moved her seatback forward, and her ponytail flopped back out of our sight. We chuckled about the episode until we landed. As we headed home from Logan after 9 p.m., I tweeted out my photo, along with a snarky comment: “Congrats to the ponytailed young woman in seat 22B. 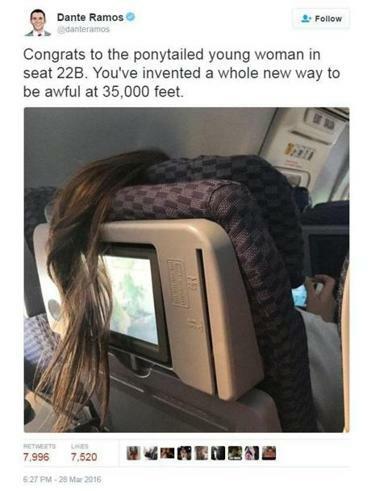 You’ve invented a whole new way to be awful at 35,000 feet.” It might have attracted a few “likes” and then been quickly forgotten, like every other dumb joke on Twitter. Instead, my post about the ponytail went viral. As I write these words, it’s been retweeted more than 7,700 times. That’s 56 times as many as a New York Times post about loose nuclear material, and 422 times as many as a recent Globe tweet about lead in the water in Boston schools. My posting generated — gulp — roughly 1,100 times as much interest as the most popular tweet about my recent column, an earnest look at a burning issue in higher ed. Sure, people around the world relate more to the exasperations of air travel than to the misery of adjunct college professors. But by going viral, I learned firsthand that what gets attention on the Internet and what actually matters in the world are two different things. Today, virality itself is somehow newsworthy. Mashable, the Huffington Post, the Daily Mail, and many other outlets published news stories — or, more appropriately, news-ish storyoids — about my experience in seat 23C. One writer for Metro.co.uk, to his credit, contacted me for more details and included them in his piece. Most of the articles were little more than wordy rephrasings of two of my 140-character tweets. It’s easy to blame the Internet, which, despite everything, remains a tremendous receptacle of human intelligence. Over the years, I’ve found Twitter enormously helpful, both as a news aggregator and as a reporting tool. Facebook and Instagram are great ways to share articles and vacation photos alike. But just like microphones and amplifiers — useful devices both — social media platforms are prone to noisy feedback. In this context, “going viral” isn’t a feature of social media. It’s a bug. This dynamic may only get worse. A while back, Facebook went from showing you everything your friends posted to selectively choosing the stuff that your friends already like. Twitter is moving the same direction; Instagram isn’t far behind. When their algorithms prioritize what’s already popular, some frivolous content, like my photo or that “damn Daniel” video that inexplicably caught on in February, will get more eyeballs than it deserves. Meanwhile, Facebook and Twitter will be able to charge purveyors of less obviously clickable items for access to their countless users. These companies aren’t charities. But the downside of relying so much on proprietary platforms, such as Facebook and Twitter, is that your needs are not their needs. Going viral still had its pleasures. I got a close look at how Internet contagion works. A few retweets from high-profile Twitter users — Keith Olbermann, the actress Natasha Lyonne — accelerate the spread of your photo around the world. Within an hour, the tweet reaches one person in, say, Malaysia, and then spreads locally. All of a sudden lots of Malaysians know about this one goofy, unimportant thing that happened for a few minutes on an airplane many thousands of miles away. On the downside, I heard from creepy misogynists and assorted angry others, and regretted that my original tweet — the digital equivalent of an eyeroll at an anonymous fellow passenger’s misstep — had, when magnified thousands of times over, unleashed a massive trolling campaign against someone who had in fact fixed a problem. Meanwhile, one user accused me of plagiarizing my own photo from Reddit, where someone else had posted it without crediting me. If nothing else, my Twitter account drew a few hundred more followers than it had a few days before. Let’s hope these new acquaintances in Canada, Russia, Greece, and points beyond are interested in — yawn — housing affordability and transportation policy. The social value in social media lies in talking about stuff that matters in real life.